I am sure by now we all know that a White Card is necessary to be able to work on a construction site in Australia, but what about a ‘Yellow Card’? Is a Yellow Card really necessary and what is it anyway? A Yellow Card, or scissor lift licence in simple terms, is developed by the EWPA in consultation with members and industry. The intention of this program is to assist operators, employers, equipment owners and manufacturers to comply with the OHS / WHS & regulation. The ‘Yellow Card’ provides evidence that the operators of specific types of EWPs have been trained in the safe use of that type of work platform. Once training has been undertaken the supplier, employer and user all have documented evidence of the training received. 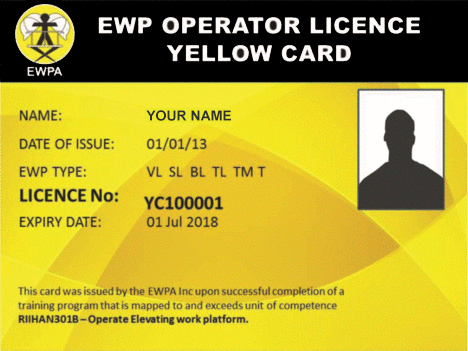 The EWP Operator Licence, or Yellow Card, is proof of completion in one or more modules in various types of EWPs. There are five different EWP training modules plus a transport module. Whilst these are all classed as EWPs, each one is very different in use and safe operation. The transport module is aimed at transporters of EWPs, allocators and the like. The ‘do nothing’ approach is a time bomb. A blatant disregard of the law (the Act is law) will result in hefty fines and or jail. We all have a responsibility for workplace health and safety. Where does the high-risk licence: 11m Boom Licence (WP) fit in? This licence covers boom type EWPs 11 metres and over (eg truck mount, trailer mount and self-propelled). It is recommended that you contact your State or Territory Regulatory Authority as licensing procedures may differ slightly in each State or Territory. Do I need a Yellow Card and a WP licence? If the operator is to only operate an EWP, self-propelled, truck or trailer mounted above 11 metre then the operator must comply with State/Territory or national regulation for high risk licensing. For operators of any boom type EWPs under 11 metres or Scissor lifts (of any height), Vertical mast/personal lifts must obtain training so that compliance with the WHS and OHS regulation is met. This can be confusing but an example may clarify the point. Example: You have just gained your WP boom licence using a mobile elevating work platform with a boom length of 11.2m. Next day you are required to operate a scissor lift with a 12.1 metre platform height. Both are EWPs and are over 11m but very different units. The High-Risk Licence identifies that scissor type EWPs are not covered under the EWP High-Risk License. However, the operator of the scissor lift is required by Regulation to be trained in its safe operation. The Yellow Card is an industry-driven training program that provides the holder with evidence of training in a particular type of EWP. It is based on EWP product type and not boom length. Another example is the case of the operator having a High-Risk Licence for a boom lift which was originally obtained on a trailer lift with a boom over 11m. The operator is now required to use a self-propelled boom lift with a boom of 12m. The operator has the required High-Risk License but no proof of training on this very different type of EWP. Yellow Card training would be required for this different type of EWP before using it. So where do I get my ‘Yellow Card’ or WP Licence? Duralift partners with Plan B Training Solutions EWPA Trainer No.1944 and Seaton Training RTO 22279 who is authorised to train & assess these programs. Training courses can be provided on location or at our offices at a time of your choice at affordable prices! Ok, so you are armed with information on the Yellow Cards and WP Licences but you aren’t certified! Keep your cool, Duralift will help you to get trained up in no time. Duralift partners with Plan B Training Solutions EWPA Trainer No.1944 and Seaton Training RTO 22279 who is authorised to train & assess these programs. Book your course via Duralift at a time of your choice at affordable prices!